Eagle's Nest Golf Club is one of two championship courses within PebbleCreek, an upscale retirement community. The course has an ideal setting that enjoys the White Tank Mountains as a backdrop and lies beneath the clear blue canopy of the Sonoran Desert sky. The layout is player friendly enough to appeal to beginners but there are still challenges in store. 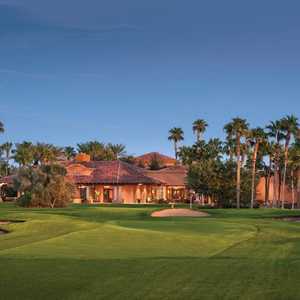 The 18-hole Palms at Palm Valley Golf Club in Goodyear, Arizona is a public golf course that opened in 1993. Designed by Arthur Hills, Palms at Palm Valley Golf Club measures 7015 yards from the longest tees and has a slope rating of 131 and a 73.